It is Friday 6th July 2012, some of the artists, aka a year 10 art class from the Harris Academy Peckham are visiting Peckham Space to see their show Double Vision, for the first time. Socially engaged practice has spread its roots deep under the pavements of Peckham; helped along by Camberwell’s MA Fine Art course which emphasises the importance of collaborative approaches to art making. * The South London Gallery has had its part to play too with its dedication to supporting and researching socially engaged practitioners. And, in fact, inlayed in to the floor of the SLG, designed by the illustrator and social reformer Walter Crane, is this, ‘The Source of Art is in the Life of a People’. Next door to the SLG, just along the road from Camberwell College of Arts sits Peckham Space: A gallery that aims to work in partnership with local communities and increase access to cultural and educational activities. Curated on a shelf are the A6 postcards showing the collage works made by the students with whom Gayle Chong Kwan worked. 80 posters featuring the collage works were also printed up and placed around Peckham to publicise the show. 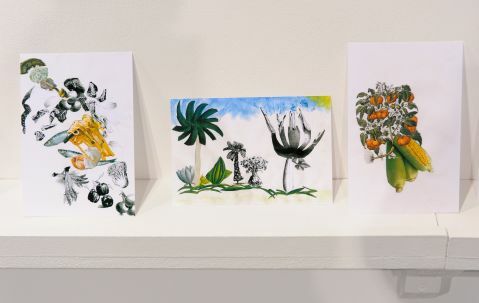 Looking at their botanical and photomontage qualities it is hard to imagine why the talking cure in mainstream art classes is not spoken about or at least considered more publicly. Listening to the pupils’ proud reaction at seeing their work within the context of the gallery space points to their investment they made into making the show happen. The show itself consist of two moments, the postcards and the audio facilitated ‘sculpture’ in the form of a raised three foot papier-mâché hillock covered in dried edibles. At first sight it is unclear as to which party of artists has made what: Chong Kwan’s hand made the sculpture. The stories that inform this audible smellavisual landscape are those told to Chong Kwan by the school children and it is with their recipes for understanding that we start to gain an insight in to what is meant by ‘Double’ in this case. As tales of mothers, far away places, ingredients, soups and fairy tales are told the work, comprised of things as far-fetched as the stalk of a pineapple, perform a metamorphosis, as it becomes that another place. The double in Double Vision is about Gayle Chong Kwan in the role of sensorial interlocutor and the tangibility of quiet stories. The aesthetic of the conversation is arguably the most demanding and generous part of this show. However, here is a diaristic relationship with food, hospitality, the host and the parasite. Double Vision seems to have come about through an oscillating parasitic relationship between Chong Kwan and the other participating artists who are not publicly credited individually for their work. An invitation offers-up a power play; an invitation to participate in an artwork that is to be personal, intimate with a dash of voyeurism. A peephole view is provided from a seat set at ground level bringing the work (exhibited in the raised part of the gallery) to your eye level. The effect is closer to that of the artist’s larger photographic pieces for which she is better known. A gateway to a world of the fantastic. A land safely spied from a distance. These are the two sides of the coin. *It is currently considered a travesty within the art community that UAL have made the decision to move the MA Fine Art program out of the Camberwell/Peckham context to Chelsea.